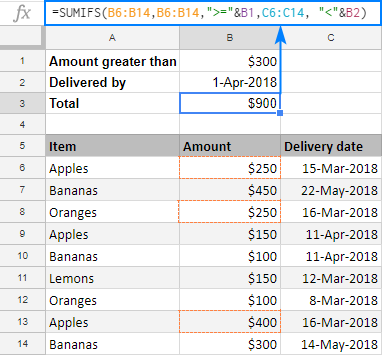 The tutorial shows how to use the SUMIFS function in Google Spreadsheets to sum cells with multiple criteria. You will find a handful of real-life SUMIFS formula examples with AND as wells as OR criteria. Google Spreadsheets provide two functions to conditionally sum cells, SUMIF and SUMIFS. Regular visitors of our blog are already familiar with SUMIF that we covered last week, and today we are going to have a closer look at its plural version. SUMIF can add up cells based on just one condition. If it is what you want, please check out this tutorial: SUMIF in Google Sheets. SUMIFS can sum cells based on two or more conditions. Further on in this tutorial, you fill find a simple explanation of SUMIFS syntax and formula examples for different data types. Sum_range(required) - the range to be summed. Criteria_range1 (required) - the range of cells to be evaluated by criterion1. Criterion1 (required) - the condition to be met by cells in criteria_range1. Criteria_range2, criterion2, … (optional) - additional ranges and criteria to test. The SUMIFS function adds up only those cells that meet all conditions, i.e. all of the specified criteria are true for a cell. This is commonly referred to as AND logic. Sum range and all criteria ranges should be equally sized, i.e. have the same number of rows and columns, otherwise your SUMIFS formula will throw a #VALUE error. Text, wildcard characters and dates should be enclosed in quotation marks like "apples" or "*" or "3/15/2018". Numbers and cell references are not enclosed in quotation marks when used on their own. Logical operators with numbers are wrapped in double quotes like ">200". Logical operators used together with cell references and other functions require the quotes ('') to begin a text string and ampersand (&) to concatenate and finish the string off. For example: ">"&B1 or ">="&TODAY(). Okay, that's enough theory, let's build some useful formulas already! When it comes to summing cells with multiple criteria, you may find a lot of different suggestions in Google groups and other user communities. 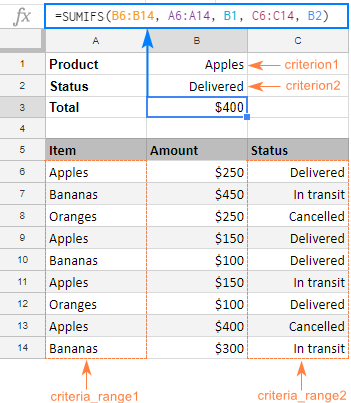 Let's say, you have a list of items in column A, amounts in column B, and delivery status in column C. Your goal is to get a total for a specific item with a certain delivery status, for example "apples" that are "delivered". How would you approach the task? What's wrong with this formula, you may ask me. Nothing except that it's excessively complex, difficult to understand and debug. It's like using a sledgehammer to crack a nut. 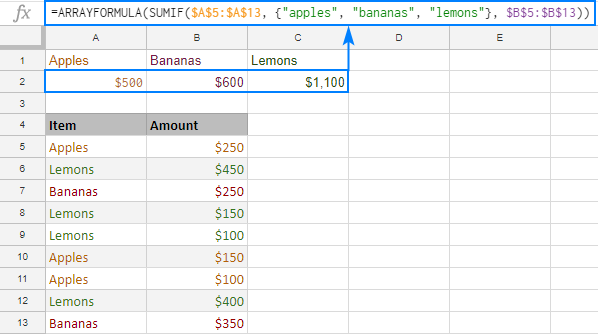 Google Sheets SUMIFS function provides an easier way! Column A should contain "apples". Assuming we have data in rows 6 to 14, our criteria_range1 is A6:A14, and criterion1 is "apples". Column C should contain "delivered". Meaning, our criteria_range2 is C6:C14, and criterion2 is "delivered". Numbers to sum are in column B, so our sum_range is B6:B14. As shown in the screenshot below, our SUMIFS formula works perfectly! Taking the example further, let's see how to use SUMIFS with other criteria types. In some situations, the conditions may depend on the results returned by some other functions. In this case, embed those functions in the criterion arguments of your SUMIFS formula. "=" to sum cells that are completely blank, i.e. contain absolutely nothing.
"" to sum empty cells including zero length strings. "<>" to sum non-blank cells including zero length strings. As you already know, by default, Google Sheets SUMIFS function works with AND logic - all conditions must match to be summed. In some situations, however, you may need to conditionally sum cells with OR logic, when any of the specified criteria is true. Below you will find a few possible ways to do this. To sum cells with only a couple of criteria in the same column, you can simply add two SUMIF functions together. Instead of "hard-coding" the items in an array constant, you can enter them in individual cells, and include cell references in the array (in case of non-contiguous cells) or supply a range (in case of contiguous cells). Replace the array elements with cells references, and you will get the most compact formula to sum cells with multiple OR criteria ever! 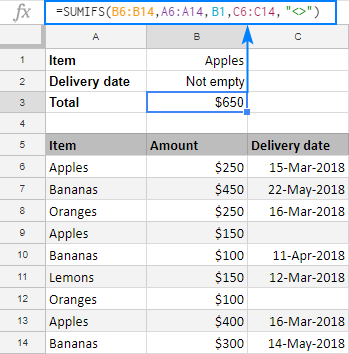 For the sake of clarity, you enter the formula only in one cell (A2 in this example), and Google Sheets will put the results into as many cells as many items there are in your array constant. Just make sure you have enough empty cells to the right, otherwise some of your data may be overwritten. This example shows how to sum numbers with several sets of conditions determined by the following logic. To make things easier to understand, please consider the following example. 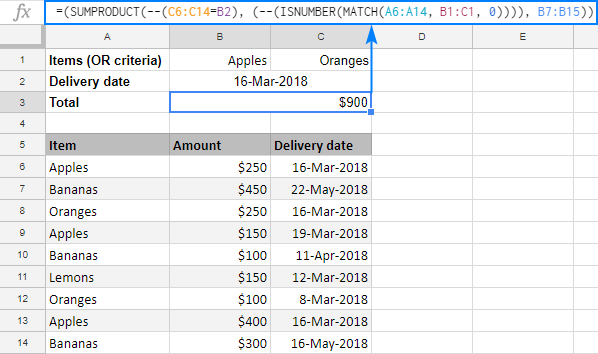 In our sample data set, supposing you want to sum amounts in column B if column A contains either "apples" OR "oranges" AND the delivery date in column C is "16-Mar-2018". 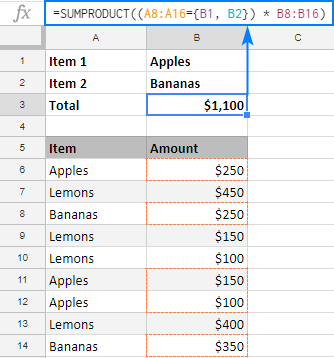 Regrettably, Google Sheets do not allow expressing multiple OR conditions using array constants, therefore we cannot make a plural version of our SUMIF with OR criteria formula. Luckily, there is another way to achieve the same result with a bit shorter formula - the SUPRODUCT function. As the result, you'll get an array or TRUE and FALSE values (TRUE if any of the specified criteria is met, FALSE if none of the criteria is met). In this formula, however, you cannot compare a range with a date directly, like C6:C14="3/16/2018" or C6:C14="16-Mar-2018", because you'd be comparing a cell with a date to a text string. Google Sheets won't understand that and you will most likely get a zero result. If done correctly, this comparison will give you another array or TRUE and FALSE. Use the double unary operator (--) to coerce both arrays of TRUE and FALSE to 1 and 0, respectively. SUMPRODUCT will first multiply the elements of 3 arrays (two arrays of 0's and 1's and an array of numbers in B6:B14), and then sum the products. Because multiplying by 0 always yields 0, only the cells that have 1 in the first two arrays will "survive". As the result, only the amounts with the specified delivery date and item names will be summed. 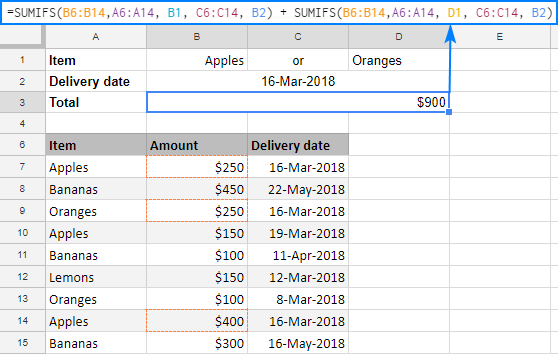 This is how you use SUMIFS in Google Sheets to sum cells with multiple conditions. To have a closer look at the formulas discussed in this tutorial, I invite you to open our SUMIFS Google Sheets Examples. I thank you for reading and hope to see you on our blog next week! 27 Responses to "SUMIFS in Google Sheets to sum cells with multiple criteria (AND / OR logic)"
I am working with stock which i normally issue out weekly. i have different columns, opening balance, quantity received, quantity issued, closing balance among others. you realise i have a formula in the 'closing balance' column that automatically calculates; (=opening+received-closing). i have another column 'number of days out of stock'. this column includes the number of days of a month (out of 30 or 31) for which the item had stocked out. * i issued out all the 50 on 21st to remain with 0, but more is received on 25th then days out of stock will become 25-21=4. i need a formula that will automatically read when the 'current stock' column becomes zero and then subtracts to return the days out of stock. (i dont mind if the formula i am looking for assumes all months have 30 days). I have a list of names in cells from G1:G20 (which can be increased later); I want that when I input one of the names in the list in D1:D500, the result in B1:B500 should read “CIS”. Can someone give an excel formula, please for this statement? I am looking for a formula. I want to count the number of individual product an agent sold in a Sunday thru Saturday date range, using two google sheets. Sheet1 has each transaction starting by 00/00/00. Sheet2 is the summary page starting with the week, agent, each product-- for 5 weeks, then on to the next agent. I wanted to use sumifs in five different sheets with assistance of a drop down list. Any help. I want a SUMIF formula about Departments i want an example of that can you give atleast 2? SUMIFS can sum cells based on two or more conditions. 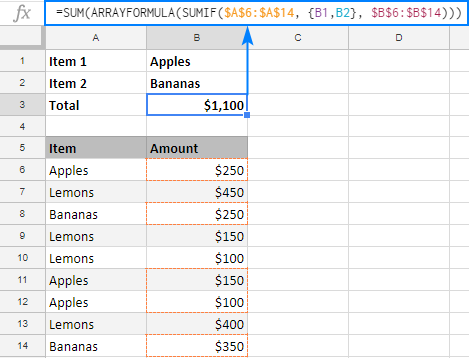 In this tutorial, you fill find a simple explanation of SUMIFS syntax and formula examples for different data types. f this is what you need scroll to the top of this page where you can begin the tutorial. Despite using the correct formula in Google sheets(or at least i think I am) , I get 0 when the calculation is done, even though I should get a sum. Any idea of why this could happen ? If you could share your sheet or at least post a formula here, we will try to figure it out. The SUMIFS function does not accept anything but ranges in criteria_range arguments, therefore MONTH(C7:C15) won't work. Hi! 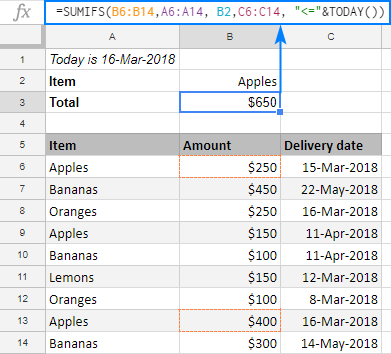 I'm trying to make a SUMIFS formula to sum up expenses where one of the criteria is date, but i have two columns with dates (Column A - Date Purchased and Column S - Date Paid). Column S only has entries when it is different from Column A, otherwise it is blank. So for the criteria range, I want to use column S if it has entries, otherwise I want to use column A.
I have a sumifs formula working right now for a running total. I now want to use the same formula to only calculate the amounts over or under 0, but do not know how to add this into the criteria. Can anyone help? The formula I am using that is working for the total is this..
How do I then total only the amounts greater than 0 to track deposits in another cell, and only amounts less than 0 in another cell for withdrawals. You simply need to add a couple of more arguments: the range and the additional condition: '2019 Balance Sheet'!E:E,"<0"
For another formula, change the condition "<0" to ">0". Brilliant! Thanks so much, I was trying something like this but wasn't getting the " & ' correct but knew I was close. what formula do I use when taking two numbers from different cells and have them equal complete sets. Example 20 RH, 55 Lh = 20 complete sets. Thank you for contacting us, Virginia. I'm sorry but your task is not entirely clear. If you could describe it a bit more, we may be able to advise the solution. I have my data base in columns, and one of them is showing quarters as (1, 2, 3, 4). Hi. I have sheet with a drop down cell with three ranges ( RW -rework, WD - warehouse damages and Re-pack). In one cell I have a formula to count the value of RW in one day. I was asked to ad in the drop down cell the range Re-pack to be added on the value of rework. I trayed to ad this range " Re-pack" in the formula but is not working. The formula is : =SUMIF(C5:C,ʺWDʺ,G5:G)and I would like to ad in this formula the range "Re-pack" to be counted in the same cell where is added the value of "RW". Hi, I have a sheet with Column A consisting of Dates, Column B consisting of Mango, Banana, Pineapple, Blueberry and Column C of their respective Prices. My query is, to sum all the fruits right from the first date till the latest date but want to exclude only Mango price right from first date except the latest date. Any help is appreciated. Thanks in advance! I'm sorry but the part with Mango is not really clear. For us to understand your task better, feel free to share a small sample spreadsheet with us (support@4-bits.com) with your source data and the result you expect to get. Just make sure to shorten the table to 10-20 rows and provide the link to this comment as well. How would I create my or argument if the arguments were numbers? For instance, what if you wanted to sum all of the orders that came to a certain dollar amount? This would make a task at work a lot easier. I'm sorry but your question is not entirely clear. Could you provide an example and explain the task in detail? If so, feel free to share your sample spreadsheet with support@4-bits.com with the data you have and the result you'd like to get. Please include the link to this comment as well. I'll look into your task and see what I can do.